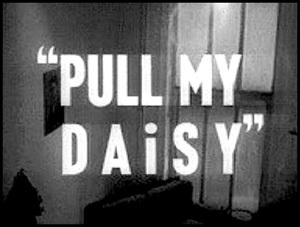 PULL MY DAISY [a.k.a. The Beat Generation] (1959). The Beat Generation of the late '50s came to cinematic life in this short film, populated by some that era's most indelible talents. Narrated by Jack Kerouac, and co-directed by Robert Frank (The Rolling Stones' COCKSUCKER BLUES) and Alfred Leslie, this was a radical experiment when first released, and is still a seminal glimpse into the Greenwich Village lifestyle which typified the Beatnik counterculture. Welcome to the world of the Beats, or more particularly, a typical NYC, East Side loft. Occupied by a female painter, her railroad-breakman husband and their young son, the fun begins when the friends and visitors arrive, in the form of Alan (Alan Ginsberg), Gregory (Gregory Corso), and Peter (Peter Orlovsky) -- struggling poets who endlessly discuss their work. When husband Milo (Larry Rivers) arrives home and encounters this impromptu gathering of poets and artists, he warns them to keep cool, since they're also expecting some conservative guests: A Bishop, plus his mother and sister. Meanwhile, they discuss Buddhism, lounge about the apartment, play their music, and even after they wake up Milo's little boy, the party still doesn't stop. 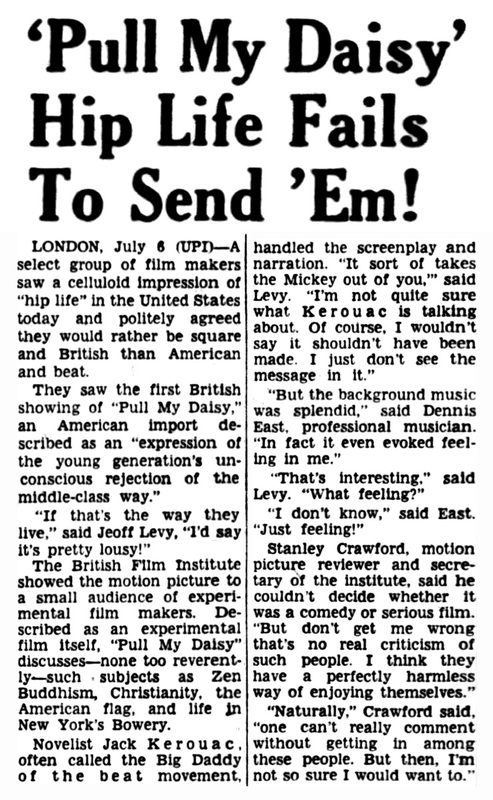 One of the only films actually created by the founding members of the Beat movement, this is a joyous celebration, with such a spontaneous air that it was often mistaken as a documentary (while old-fogie columnists like Walter Winchell labeled it a "beatnik-borenik film oddity"). Unlike Hollywood's limp attempts to recreate the era (THE SUBTERRANEANS, HEART BEAT), this project successfully captures not only the Beatnik slice of life, but their creative energy. Loosely based on Kerouac's unfinished stage play, "The Beat Generation", and inspired by the lifestyle of Neal Cassady and his wife Carolyn, the actual footage was shot without sound, while Kerouac's inspired narration was spontaneously created during his first viewing of the movie. Full of "hep-cats" and "hipsters", his voice-over brings a genuinely unpredictable vitality to these "gum-chewing geniuses." 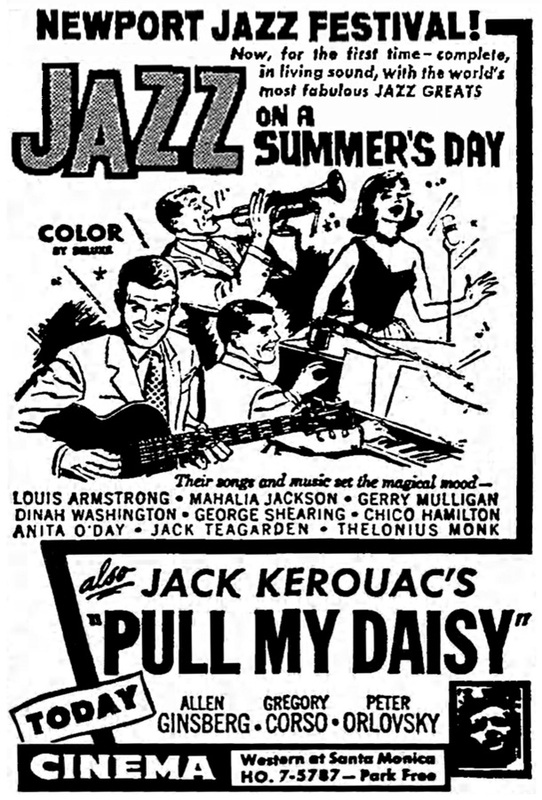 Though gleefully unfocused in terms of its story, the emphasis is instead on high-spirits and stark imagery, juxtaposed with Kerouac's increasingly loopy, always poetic narration, and bookended with "The Crazy Daisy" theme, sung by Anita Ellis and with lyrics by Ginsberg and Kerouac. Fueled by a laid-back, urban realism rarely found in films of that day; appropriately enough, when first released in New York City, this was double-billed with John Cassavetes' independent watershed SHADOWS.